Sabres lose to the Jets 3-1 at home. Captain Jack Eichel speaks to the media. BUFFALO, N.Y. (WKBW) — When the Winnipeg Jets are tied after the second period they don't lose. On Sunday, they improved to 11-0, turning a 1-1 tie after 40 minutes into a 3-1 win over the Buffalo Sabres. With the loss, the Sabres slip to 27-21-7 on the season. When you can't win back-to-back games you're never going to inch closer to a playoff spot. With their loss to the Jets on Sunday, the Sabres haven't won back-to-back games since Dec. 11 and Dec. 13. If the Sabres are going to claw their way back into the playoff picture they're going to need to go on a little bit of a run and win consecutive games, or who knows, maybe even three in a row! 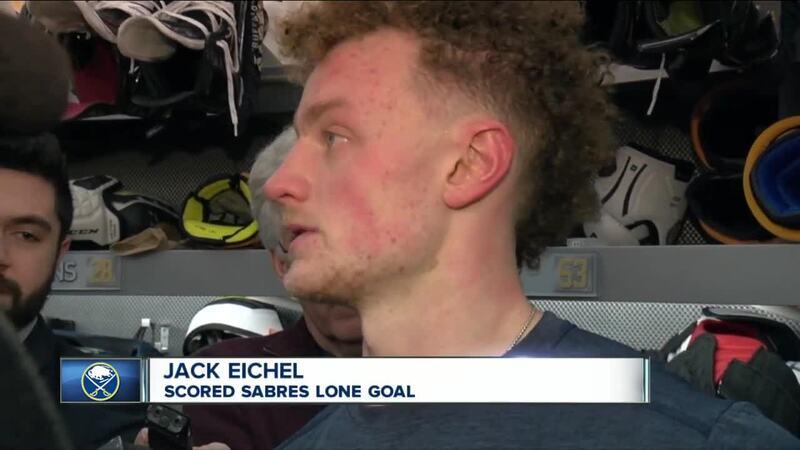 "I don’t know how many times we can take the moral victory anymore," Sabres captain Jack Eichel said after the loss. "I mean, we’re 55 games into the year. How many times can we say, ‘Oh, we played well but we didn’t get any points? Other teams are getting points, moving up the standings, and we’re not. Good news -- New Jersey knocked off Carolina, keeping the Sabres just two points back of the Penguins for the final playoff spot and one point behind the Hurricanes. Goaltending has been an area of concern for the Sabres since their 10-game win streak came to an end in November. Despite getting handed the loss, I was very impressed with Carter Hutton's performance against the Jets. He stopped several quality scoring chances from the Jets and was beat on two plays where he was left out to dry. With two more games left on the homestand, I wouldn't be surprised if Housley elects to give each of his goaltenders a start. In the second period, Rasmus Dahlin dropped down to one knee to try and keep a puck in at the blue line on the power play. Instead, he whiffed and Jets forward Andrew Copp had a clear breakaway. He made no mistake, firing a perfect wrister past Hutton to give Winnipeg a 1-0 lead. Sure, you'd like to see Dahlin make a smarter or safer play in that particular situation. However, he's still a rookie and he's going to make mistakes. As long as he learns from them, which I'm sure he will, there is no use getting too hung up on the poor decisions he makes. More often than not he'll make the right play and remind us why he's one of the best defensive prospects in years. By the way --Dahlin picked up another assist on Sunday and now has 31 points on the season with 27 games to play. Despite an impressive 10 points in 12 games, Jack Eichel has only three goals since the calendar turned from 2018 to 2019. On Sunday in the second period, he found the back of the net for the third time in the last 12 games, beating Connor Hellebuyck with a perfect shot from the slot. More likely than not, Eichel will start scoring at the pace he's shown in his first four seasons and perhaps his goal against the Jets will have a domino effect. If the Sabres would've been able to convert on one of their five power-play attempts against the Jets the game could've had a much different outcome. Instead, the Sabres failed to generate consistent pressure and couldn't build off their performance Saturday, where they scored twice with the man advantage. For a team that struggles to score at even strength, the power play can be the ultimate equalizer but that didn't happen Sunday.